The close relationship between the Commerative Air Force (CAF), DFW wing and the Cold War Air Museum lets us work together to bring vistors to the airport and our museums. It is an exciting day whenever either of us brings a new exhibit on line, especially a historic flying exhibit. 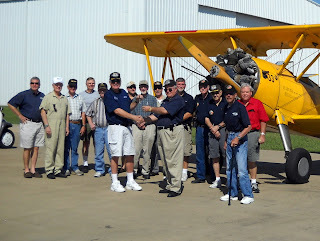 The DFW wing won the competition for sponsership of this fine example of a Stearman trainer. Shown here are a number of the aircraft sponsers as well as other volunteers gathered to greet and receive the plane on its arrival Saturday. 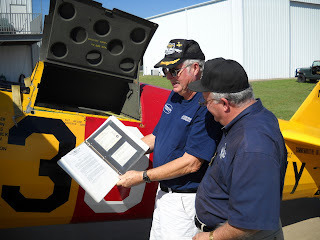 Charlie checks the paperwork and condition of the aircraft, it is perfect. 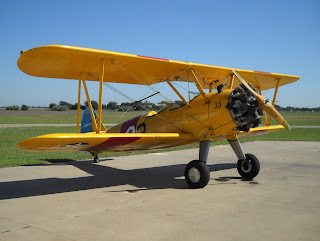 As anyone who has flown a Stearman will tell you, it has to be flown "all the way to the chocks". As a WWII trainer, it taught thousands of avaiators that a moments inattention can bring disaster. The aircraft will groundloop in a heartbeat. As a fine example of aviation history, "Niner-three-three" has found an excellent new home with a group that will appreciate her.